Christina FourHorn was mistakenly arrested by Denver police for robbery. Officials meant to arrest Christin Fourhorn. (CNN) -- Three police cars pulled into Christina FourHorn's front yard one afternoon just before she was supposed to pick up her daughter at school. The officers had a warrant for her arrest. "What do you mean robbery?" FourHorn remembers asking the officers. Her only brushes with the law had been a few speeding tickets. She was locked up in a Colorado jail. They took her clothes and other belongings and handed her an oversize black-and-white striped uniform. She protested for five days, telling jailers the arrest was a mistake. Finally, her husband borrowed enough money to bail her out. "They wouldn't tell me the details," she said. Later, it became clear that FourHorn was right, that Denver police had arrested the wrong woman. 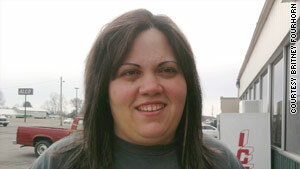 Police were searching for Christin Fourhorn, who lived in Oklahoma. Their names were similar, and Christina FourHorn, a mother with no criminal record living in Sterling, Colorado, had been caught in the mix-up. FourHorn went public about her case more than two years ago, filing a lawsuit that alleged the arrest violated her constitutional rights. The Fourth Amendment protects citizens from arrest without probable cause. The problem of mistaken arrests continues, said attorneys with the American Civil Liberties Union of Colorado. The group, which represented FourHorn, calls Denver's police work "recklessly sloppy." An ACLU mistaken identity lawsuit on behalf of four other people is pending against Colorado police agencies. A mistaken identity arrest occurs almost every day, said policing experts and officials at the National Association of Criminal Defense Lawyers. But most people taken into custody are released shortly after the mistake is realized. Since the FourHorn case, the ACLU found at least 237 cases in Colorado in which police may have arrested the wrong person. The figure is likely a small sample since police often release those wrongfully arrested before the first court appearance, the ACLU said. "We are trying to demonstrate that this is a widespread practice," said Mark Silverstein, an ACLU attorney who filed FourHorn's suit in 2008. FourHorn's case was settled, and the terms remain confidential. This is not some fluke in a rational system. "This is not some fluke in a rational system," Silverstein said. "It's something that happens regularly, predictably, and therefore the city should be doing more to ameliorate the problem." "Defendant states this is not him and he has never driven a car!!!!" said one. "Dismissed, wrong defendant. Sister used her ID," another said. In 2009, Denver's Department of Safety found 51 cases in which a person claimed the warrant naming them was incorrect -- a number that's a small fraction of the 46,864 people arrested that year. A Denver police spokesman declined to comment on the mistaken identity arrests. "While no one should be misidentified and incorrectly held in jail, we realize it can happen," said Mary Dulacki, records coordinator for Denver's manager of safety. Experts at the Legal & Liability Risk Management Institute said name similarities such as in the FourHorn case are a common reason for errors. The group, based in Indianapolis, Indiana, trains police departments across the country on how to avoid mistaken arrests. Other times, police may be relying on a person's alias. Suspects often give officers false names, which remain on their records as an alias. Also computer typos and glitches lead to mistaken identity arrests, policing experts said. An alias mistake allegedly occurred in March 2007 when Denver police arrested Muse Jama, a college student studying for an exam, under a warrant for a person named Ahmed Alia. Jama's name had popped up as one of Alia's aliases. Jama protested and showed the officers his identification cards. Still, he was arrested and remained behind bars for eight days. His lawsuit against the Denver Police Department, filed in 2008, is pending. Naturally police think people are lying when the person says they didn't do it. "Naturally police think people are lying when the person says they didn't do it," said Jack Ryan, an instructor at the Legal & Liability Risk Management Institute and police officer for two decades. "But that doesn't change the fact that there needs to be an investigation," he added. "The overall philosophy of justice in this country is that an innocent person shouldn't be locked up." In Christina FourHorn's case, she was about 100 pounds heavier than the suspect, Christin Fourhorn. Her middle name is Ann, while the suspect's middle name is Blue. She was also seven years older and didn't have a tattoo on her left arm, which the suspect did. But the problem doesn't exist solely in Colorado. In New York this month, a 37-year-old man filed his second lawsuit against the New York Police Department, alleging he was wrongfully arrested twice -- even after receiving a $120,000 settlement for an earlier mistaken arrest. In Florida, several mistaken identity arrest cases made headlines in 2009. One case included a Naples high school coach who was arrested on drug charges because of identity theft. Advances in fingerprinting technology have made it faster for police to identify the right person. But police departments across the country continue to face obstacles. An agency that issues the warrant may not be the same agency that makes the arrest and puts a person in jail, according to criminal justice experts. Even when faced with protests, jail officials can't get to the bottom of things until they get in touch with the warrant-issuing agency, attorneys said. Arrests can cross state lines, which can take weeks or months to clear up, said William Buckman, co-chair of the National Association of Criminal Defense Lawyers' Law Enforcement and Prosecutorial Committee. "Too often law enforcement doesn't reinvestigate, doesn't call for a superior," he said. Buckman, who practices in New Jersey, said he gets several calls a month from people caught up in mistaken identity arrests. The growing frequency of identity theft also has put a strain on officers, said Jay Foley, head of the Identity Theft Resource Center in California. One part of Foley's job is to help victims of identity theft and mistaken identity arrests clear records. Police need to keep a database that not only lists a suspect's aliases but also includes information about the people who have been wrongly arrested, he said. "You will have fewer people in jail, sitting and waiting," Foley said. In Denver, the police have developed a process to report when someone protests an arrest, claiming a case of mistaken identity. Fourhorn is now 36 and still living in the same Colorado home where police arrested her. She recently had her record expunged of the mistaken robbery and assault charges. The process took almost two years, even though she should have never even been arrested in the first place. The arrest almost cost her her nursing job, she said. She said her family won't get back $3,500 her husband borrowed to pay a bondsman to get her out of jail. When FourHorn sees a police car, she says she gets uneasy. She knows she shouldn't. But then again, she reasons: "If it happened once, it can happen again."